I. Scrape the dirt off your shoes on the iron scrapes provided for that purpose. II. Do not spit on the floor of the chapel. III. Do not put your hats and caps on the chapel windows. IV. Do not rub against the papered walls of the chapel. V. Do not put your heels on the washboards. VI. After coming in at the passage door shut the door after you. 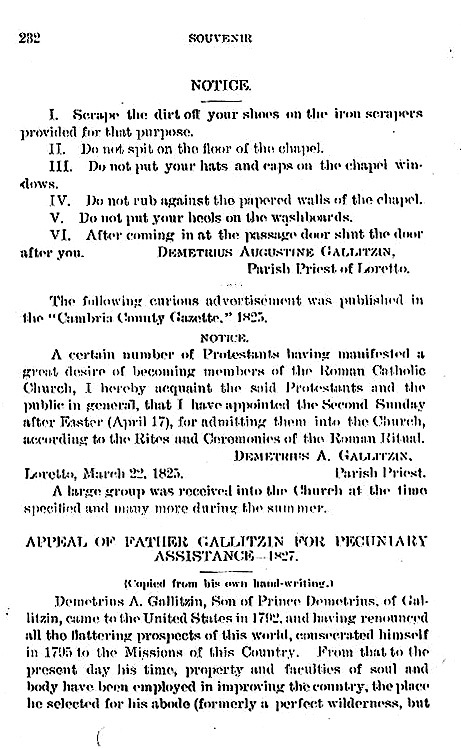 A certian number of Protestants having manifested a great desire of becoming members of the Roman Catholic Church, I hereby acquaint the said Protestants and the public in general, that I have appointed the Second Sunday after Easter (April 17), for admitting them into the Church, according to the Rites and Ceremonies of the Roman Ritual. A large group was received into the Church at the time specified and many more during the summer.